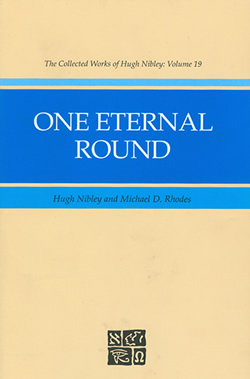 One Eternal Round is the culmination of Hugh Nibley’s thought on the book of Abraham and represents over fifteen years of research and writing. The volume includes penetrating insights into Egyptian pharaohs and medieval Jewish and Islamic traditions about Abraham; Greek, Egyptian, and Mesopotamian myths; the Aztec calendar stone; Hopi Indian ceremonies; and early Jewish and Christian apocrypha, as well as the relationship of myth, ritual, and history. The final groundbreaking chapter delves into geometry and mathematical relationships depicted on Facsimile 2. All these are woven together into a magnificent tapestry of evidence demonstrating that the book of Abraham and its facsimiles represent actual ancient materials and traditions. This book would not have come to fruition without the efforts of co-author Michael D. Rhodes. Includes illustrations by Michael P. Lyon. I hope to soon get a copy and write my reflections about it. The book is available from the BYU Bookstore and Deseret Book.